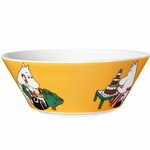 Moomin bowl Moominmamma by Arabia presents the mother of Moomintroll. Moominmamma has a gentle and caring character and she makes the best pancakes in the world, but she also enjoys a good adventure every now and then. The ceramic Moomin bowls cheer up any table setting, and their simple design is great for serving soup, cereals as well as desserts. The mugs, bowls and plates of Arabia’s Moomin Classics tableware collection illustrate the characters of the Moominvalley from the front and behind. First pieces of Arabia’s Moomin tableware came out already in the 1950s, and the large-scale production began in 1990. All the illustrations are done by Tove Slotte who draws inspiration from the original drawings by Tove Jansson. The form of the collection comes from Arabia’s timeless, ceramic Teema tableware designed by Kaj Franck.